What It Takes To Be A Florida Trail Hiker in the FTA’s 2014 Winter Footprint magazine. It’s on page 15 if the doesn’t take you directly there. 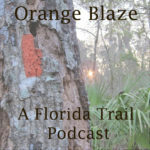 The Trail Show #21: The FT: I was a guest on the Trail Show podcast where I talked about the Florida Trail. +Thru-Hiker Information Packet: information on permits, maps, and other vital information for your hike. 1100 Miles: Discovering Florida’s Hidden Trail via the Naples Daily News. I’ve gathered these from around the web—if you’d like to be included drop me an email or leave a comment on an episode!